Not to brag, but we have 2 blogs. We eat steak at www.steakclub7.com and we eat burgers at www.burgerconquest.com. 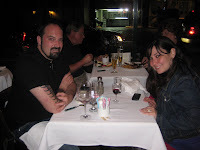 Sometimes we do both in the same blog. Some call that gluttonous but we call it righteous. 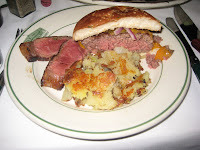 I recently received a suggestion from loyal follower, Herman T., who was praising the burger at Smith and Wollensky Grill in Manhattan. 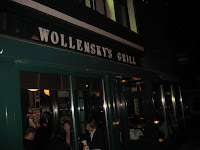 Smith and Wollensky, a famous chain steak house, first opened at their New York City location in 1977. Since then they’ve expanded to Las Vegas, Chicago, Boston, Philadelphia and more. This location in particular received a spot of fame from a scene in the movie “The Devil Wears Prada” starring Meryl Streep and Anne Hathaway. 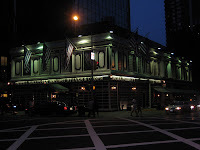 The Grill is located in the S&W; building but the entrance is around the back on 49th St. No reservation needed but host extraordinaire, Tim Dufffy will set you up with a nice table, just like he did for my wife and I. 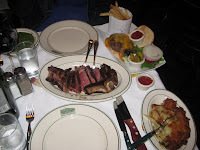 We ordered the Smith and Wollensky burger, the same way we ordered our bone-in NY Strip: medium rare. 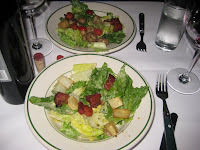 They arrived together along with the french fries, creamed spinach and hash brown potatoes we ordered on the side. First bite of the burger had me intrigued. Something was different about this one. Although it looked like your traditional old-school burger, that I like to call “Dad style” but it had a secret I could not pinpoint. The steak on the other hand, not so interesting. The cut was fatty and served just above room temperature which is a huge let down when you are spending that kind of money on an entree. 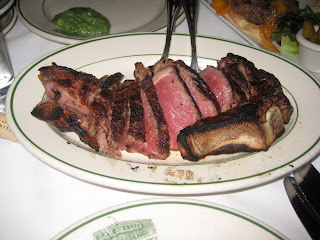 Steak should be served hot and cooked just slightly under how you ordered it, sitting in a bath of it’s own juices. That way it stays hot, juicy and cooks up just right. No juice, no hot and lots of fat. The fries were delicious and the wife claimed to love the creamed spinach. The hash browns were pretty good but needed some oomf like grilled onions or some paprika, but overall good. The burger was a winner and so was the service. Tim came over several times to check in with us. 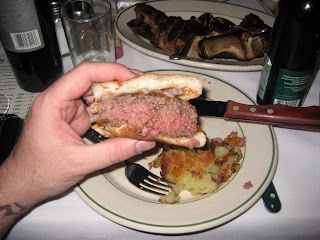 On one such visit, Tim solved the mystery of the tasty burger; they combine ground beef along with trimmings from the cuts of steak to make the Smith and Wollensky burger. You can definitely taste the Fillet cut in the burger and it is darn tootin’! P.S. Thanks for the recommendation Herman. 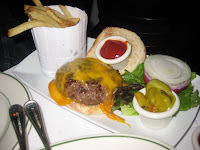 This entry was posted in Burgers, Hamburgers, New York and tagged best burger, burger conquest, cheese, ciancio, french fries, hamburger, nyc, rev, review, smith and wollensky, steak, steak burger, steak cub 7, the devil wears prada, the grill. Bookmark the permalink. Hey! I couldn't find an email contact for you (am I blind?). Just found your site through someone posting it on Scott Gold's FB status… Curious about the conquest and its specific details! 🙂 I'm thinking about taking on my own burger quest!